1.3.3 Which evenings(s) are you available to host your BOF? 1.3.6 Anything else we should know about your proposal? Where 2.0 BOFs wiki page, Where 2.0 BOFs overview > Geo Microformats BOF II: Developing a "directions" Microformat BOF page. Tim O'Reilly and Bill Gates recently discussed microformats, and the need for a directions microformat became clear. 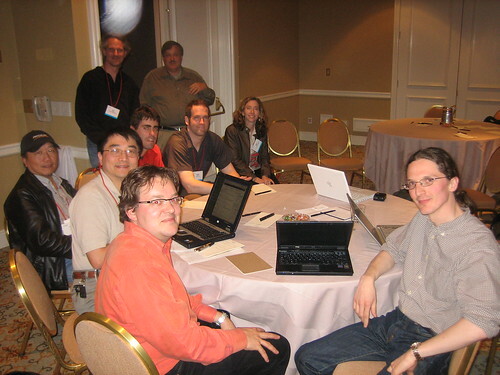 This sequel to last year's Microformats BOF at Where 2.0 will discuss the work on the directions microformat to date, and brainstorm on proposals for a directions microformat. Anyone interested in *simple* standards for publishing and sharing geo related information on the Web, in particular directions information. Which evenings(s) are you available to host your BOF? I am available to host the BOF on June 13th only. My recommended time is from 6:30pm-7:30pm. Last year at the inaugural "Where 2.0" conference, the Microformats BOF brought together key folks in the geo and microformats communities and together we were able to brainstorm and develop the "geo" and "adr" microformats. During the opening keynote at the Mix06 conference this past March, Tim O'Reilly engaged Bill Gates in a discussion about microformats. During that conversation, Bill Gates specifically noted that we need microformats for contacts, events, and directions. The first of those two have been well defined by hCard and hCalendar microformats. However, a directions microformat has yet to be defined. Research has begun towards the development of a directions microformat. Tim O'Reilly and Bill Gates recently discussed microformats, and the need for a directions microformat became clear. This sequel to last year's Microformats BOF at Where 2.0 will discuss the work on the directions microformat to date, and brainstorm on proposals for a directions microformat. Thank you for filling out the BOF Request Form. If you have any questions, please contact Vee McMillen at vee at oreilly dot com. Direction By Landmark: leaving from Fairmont Hotel front door, making a left, next block take a right, cross the street and then enter Gordons Beer.